This is the Seabright House Blend brought to you by Verve Coffee Roasters. 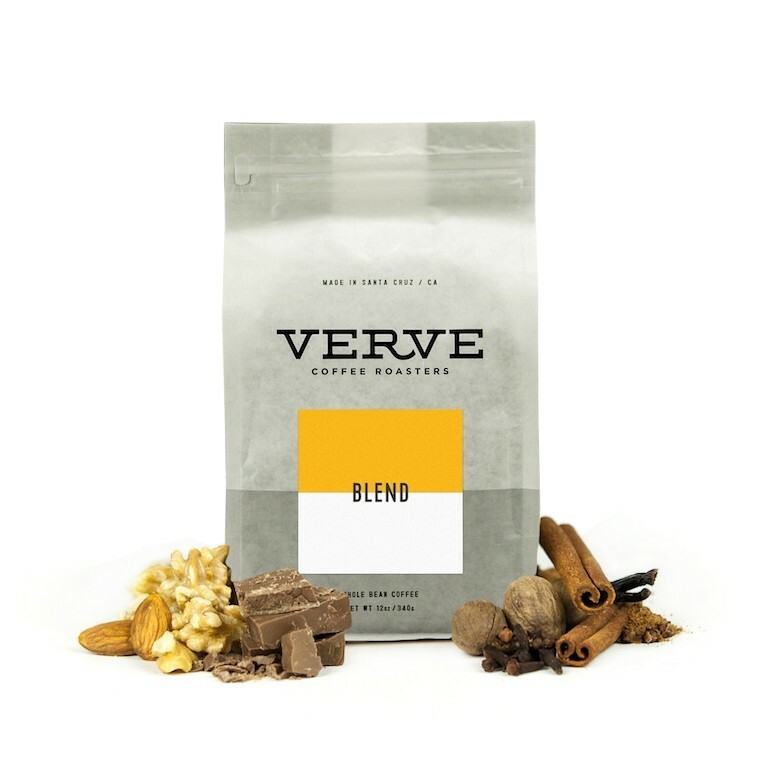 While the components of this blend change seasonally, Verve keeps a consistent flavor profile to produce a round, creamy body, and a coffee that is classically sweet and balanced. This coffee is balanced and comforting with a mix of fudgy chocolate notes with nutty sweetness. Very tasty espresso, smooth and sweet. Lighter than my normal preference but this had the perfect coffee taste...not fruity or nutty or anything special, just coffee done right. This may be my favorite so far!! I so enjoy drinking it every morning. More like this one please!!!!!!! This is my second back from Verve coffee, and I think perhaps I'm just not a Verve fan. There are some better chocolate notes as you drink it cold, but overall, it's just not that great. Wasn't a huge fan of this one. Not bad, but not as good as the last batch. Really like this one a lot! Very nice but somewhat particular when it comes to brewing technique. Nice, balanced flavors- chocolate/fudgy. Even though I do like some bold smoky flavors sometimes, this is not bitter, yet also not too sweet for my liking- nice balance. Favorite coffee I’ve received so far! In my opinion, it was pretty acidic. The chocolate was easy to pick up, but I was not about to catch the nutty notes. It was decent, but nothing to write home about. This is my favorite coffee so far! Rich with a hint of coconut. Really chocolatey and smooth! Really enjoyed this coffee. This coffee worked really well as an evening coffee or an early morning coffee. I have had this coffee many times before subscribing to mistobox. I love it. Smells great, lingering tobacco and spices. But very acidic. This was an excellent coffee. Had a rich mouthfeel with a delicate dance between the chocolate and nutty flavors. Nice coffee, smooth, nutty, fudgy like it said. Would buy this again. Absolutely delicious blend! Definitely one of the best shipments I've had so far! Amazing! One of the best coffee shipments I've had so far with Mistobox. Loved the dark chocolatey and nutty flavors without it being too heavy and acidic. This was good but not amazing. The flavor was not very complex or memorable. It was a bit weaker than I like (I like light to medium coffees). Nice aroma and a tasty brew. Great easy Sunday morning cup of coffee. Nice flavor when brewed a bit strong, very smooth and perfect for the morning cuppa. It's noted as medium-light and I think my preference may be more towards the medium-dark. Still a very enjoyable coffee. Loving this coffee, especially the nutty notes! Great coffee with nice body. Loved every last drop of this coffee. Bold flavor and smooth acidity. Prefer a bit stronger and sweeter. I try to replicate what I taste when I have coffee in Italy. Amazing scent from the coffee beans! Taste was good, but on the light side for me. Overall, a good start! I liked this coffee. It was a bit lighter than I normally drink, but I liked the smoothness of it. Perhaps a bit fruity for me, if anything. The Roast: Somewhat light. I think I would like a darker and more robust roast, but I will also be modifying my aeropress method which could make a difference. Flavors: I liked the chocolatiness. I also enjoyed the balance and smoothness. Really enjoying this coffee! Very well rounded and balanced. The chocolate notes shine through nicely. New taster here. I liked this coffee a lot - could definitely taste the chocolate notes. I will probably like a bolder coffee more, but I'll need more experience to know for sure. I can tell this is a quality coffee, but I do not like the style. I prefer a bolder coffee and a darker roast. NOTE: This is at least the 3rd time that I have made notes on this selection. Is there anyway to know the notes are delivered and a way to view past notes? Only had one cup so far, but I liked the nutty flavor. First cup might have been a little too thin or light, and had a slightly metallic taste, but I liked the flavor difference from what I've been drinking so far (SBX Pike Place). It’s okay. A little on the bitter side. It has a little of a sour/bitter aftertaste. RIch, chocolatey, delicious. I will be very sad when the bag is empty! Hey man. I really don't care for this one. Can you go ahead ship the next one? Coconut falvored. Notes not bad, but a little weak. Did you enjoy the Seabright House Blend more or less than your first coffee? I enjoyed the Seabright slightly less than the Bravissimo blend. Did you like the roast level (bean color)? This is about the darkest roast level I'd prefer to see. Typically, I like lighter roasts more. What flavors did you like or dislike? I liked that it was balanced and smooth, but it didn't have a distinct flavor that I love. It wasn't burnt or bad tasting, but just "alright" - there were no nuanced flavors that really stood out for me. I've had single origins from Verve like their Ethiopian that I found to be more bold and enjoyable to drink. Did not care for this one at all. Made me want to stop drinking after half a cup. Amazing smell, very rounded taste. Nothing at all wrong with this coffee, just not one of the favorites and not as good on our palates as all the others so far. Seems to have a slightly bitter aftertaste I was not expecting and don't love. Definitely a favorite the initial smell was excellent. Made my last cold brew batch of the year with this Seabright House Blend from Verve. It was not nearly as good as the batch I made using Three Star Blend from Populace Coffee. I've heard a lot of good things about Verve, so I'm more than willing to give them another try. Maybe the cooler room temps affected the outcome of my cold brew. To me, this coffee just tastes like... coffee. It's smoother and a bit balanced, but nothing special. I've brewed it several times myself and had some baristas make some on a kalita wave (same as my device); actually it was a lot better (to me and the baristas at Vesta in vegas) than the Cat & Cloud Guatemalan Francisco Morales I also had them brew. So all-in-all, decent coffee, but nothing special. I think I prefer more fruity notes, but I still don't have the vocabulary to truly express what I'm tasting (good or bad). I just know the majority of the espresso's I enjoy tend to be on the chocolate or fruit side. Excited for the next coffee! It was perfect. Mellow and flavorful, bright enough to drink straight with no cream or sugar. Too nutty for my taste. Slight bitter aftertaste and hard to dial in for the perfect cup. Nice coffee, really enjoy it. Only giving it 4 stars due to the fact that I haven't got a lot of brands and flavors to compare it too. So far though it is delicious and I can definitely taste the nuttiness. Good coffee, a little light and straightforward for my tastes, but I can't fault the quality. Really liked this one. Better than the Kickapoo. Very smooth, sweet, and nutty. Would try something slightly darker but otherwise this is close to my ideal house blend. Easily in my top 2! Great aroma, flavor. Nutty and complex, smoooth! Superb. Good creamy body, and I like the sweetness that follows in the aftertaste. It's a little more acidic than I expected, especially when you brew as pourover, but all in all a good solid coffee. This is a nicely balanced cup of coffee. I really really like this one! It's so delicious and smooth! This coffee is amazing. Not quite perfect (needs a bit more chocolate flavor peeking through) but this is quite excellent. I really liked this coffee. It had a good flavor with a smooth finish. Brewed with Aeropress. Chocolate for sure. I got a slight hint of the coconut. Smelled sweeter when ground than I tasted in the cup. Also, didn't notice much fruity acidity mentioned in many of the reviews. I loved the overall flavor of this coffee so much, possibly some of the best coffee I have ever had! I would definitely try more ones like this. This one wasn't as much of a favortite... the citrus noyes came through and I realized I wasn't a fan of that. Flavor profile is very consistent with my experience. To me, the flavor is mild and a good daily cup. it's OK... i don't love it, i don't dislike it. Living in the Bay Area we get a lot of opportunities to sip Verve coffees. The Seabright blend is actually one of my go-to pour-overs at my local coffee shop. I really like the level of citrus and the balance with the chocolate/roasty notes in this one. I like this coffee, for sure, but would appreciate the opportunity to taste more non NorCal blends! Not sure what to rate it seeing as how this is my first choice other than foldgers lol. But I really enjoyed the fudgy chocolatey flavors. I was looking forward to the citrus and chocolate it did it was going to be, but when I got it it was coconut and chocolate. But that's okay it was still good! Made using Bodum Pour over, blade grinder ground "to order"
Tended to not like the body on this as much as the previous coffee. tended to come out slightly sour, although that might be an extraction problem. Noticed the citrus, but it was very subtle, didn't get much cocoa notes at all. Pretty good. Still too much citrus going on. Although it is a good coffee I am looking for more of a bold coffee. I enjoy a dark roast! Very drinkable coffee but doesn't have a "wow" factor. So smooth with just a touch of acidity and just a subtle hint of chocolate. I did brew this with a Chemex primarily so it took that body out of it. Will try it in my Moka Pot and see how that tastes. But great flavor. I was afraid I wouldn't like this milder roast but it was great. I thought it was great but I might like to try something slightly darker next time. I'm enjoying this coffee. I'm not sure about the citrus portion but it is a good coffee. A good tasting coffee with an amazing smell. Had a roasty taste to it. Still not sure if I like lighter or darker beans. Really liked this blend! Smooth and the chocolate was a nice touch. I'm a big fan of this one. It's a good balance of flavor. I liked this better than the shipment from Good Folks. I really enjoyed the mild flavor and the creamy mouthfeel. Seems like every time we have some Verve coffee we are satisfied. Really well balanced with great citrus notes. I was thoroughly impressed with this blend, and have enjoyed using it most days. While I have still added some sweetened creamer and a simple syrup, it is much less than I've used in home brews (and what a coffee shop would use) in the past. This coffee has a very nice profile that doesn't feel harsh, and is quite pleasant to consume. The brew does have a very distinct cocoa flavor, which was a nice change. The blend is described to also have a subtle "citrus" flavor, to what I was very excited to taste. The citrus flavor is so subtle it is something I only tasted as an afterthought, but there was a nice transition between the two flavors. Spot on with this blend. Two days of consistent coffee and I am excited for my next cup tomorrow. Love the flavor! Send more in this range. I am excited to see what roasters you come up with next! This coffee was bright and refreshing. My wife made my first cup. I was pleasantly surprised at the rich flavor of citrus that came along with the taste of coffee in the morning. I quite like this coffee. I've been a Buena Vista Dark Roast person for the last year or so when I buy Verve, but this coffee is also quite good. The next time I buy directly from Verve it will be a bag of this. I have enjoyed this coffee both black and with frothed whole milk. I enjoyed the smoothness, and the lack of acidity compared to my normal cup. It had a good set of flavors, and stood up well to the taste of the milk, which I appreciate as others I've tried are overpowered. The citrus flavors helped to wake me up, and were very enjoyable. I really liked this blend, and could recommend this as a good 'every day coffee'. The Seabright House Blend is a bit too citrus for me. Citrus flavor a little overpowering. I generally do not go for flavored coffee. If I go I prefer vanilla flavors, but not vanilla-nut as I do not like nutty coffee. Excellent taste! This coffee brews perfectly. It's very balanced and drinks equally well by itself as well as with food. Too much citrus flavor. Would like a darker roast. The first time I made the coffee I didn't like it at all, the second cup was better, and by the third time I really liked it. There's a too much citrus in the cup for me, I'm not really a fan of that. Overall a solid cup, but not a coffee I crave. Great coffee to my taste. Low acidic, balanced , very smooth yet rich and enjoyable that left me wanting to drink more. Not as bold as some of our favorites. I really like this coffee, but I think something a little more bold would be better. I've tried varied amounts of water as well. This one was really good though. very balanced flavor and subtle. good body, and richness, the only thing lacking was what i would call a uniqueness. when i drank it, my reaction was, this is a very good cup of coffee, but nothing in the flavor profile really stood out. it's on the medium to mild side of the flavor spectrum. Good so far in lattes and cortados. Flavors aren't in your face but subtle and flavorful. A very drinkable and easy everyday bean to have. I really like this, so good to the last drop... even cold. It seemed liked a good blend between light and heavy. It's been my first brewing in my new V60 and aeropress, and grinding with burr grinder...so I'm hoping to hone in my technique as well. Was weak. It was ok but not a favorite. I really enjoyed this coffee. I give it 4 1/2 stars. If there was anything I could change about it I would say it would be better without the slight citrus sour taste at the end. I did enjoy trying it however. Liked this very much! Smooth, balanced, not acidic. Good caramel and chocolate flavors! My first impression with this coffee is also my first try with a hario v60. The coffee was smooth and flavorful. I enjoyed the variety of flavors. Initially, I was concerned because I don't like coconut, but this coffee is good. All together, this was one of the better cups of coffee I have had. We love the roast, and the chocolate-y notes are delish! It's also bright without being too acidic, and has a little sweet/fruity something that makes it easy to sip on even after it's sat a little while. Brewed with a French press it has a creamy mouth feel with a nice chocolate flavor. My palate didn't pickup the citrus notes but they're probably there. Brewing as pour-over, the creamy mouth feel is there but as expected, it's not as pronounced as with the French press but still retains the chocolate flavor. Very well balanced cup with great body! Tastes like a crisp fall evening. The color of the sky just before it goes completely dark. Smells like the loam of fallen leaves before they return to the earth. A real earthy full body taste with a surprise sweet ending. It lingers on your tongue as the stars rise. Sorry, I'm not sure how to describe flavors in coffee yet, but I do know I like balanced ones with chocolate/caramel/sweet notes, which this one is. Personally, I find the citrus to be too pronounced for me. It's like drinking a caffeinated grapefruit. This coffee was more enjoyable as it cooled, as the citrus notes were able to come out more. The chocolate was a little overpowering for me. It's really bland, even though I tend to brew coffee with a higher coffee to water ratio than is recommended. I prefer coffees that have a bold, heavy coffee flavor; this one is anything but bold. I think the "sweet flavors" in the description are diluting the coffee for me. Although I don't find it overly sweet, I think those citrus notes are tame (which is good because I don't like fruit notes in coffee) but I'm not really getting a strong coffee flavor either. I like this blend it's good. It has a great overall mouth feel with very low acitidy and no astringency. Super easy to drink and very well balanced. I get hints of the chocolate notes on the back end as well as in the aroma. I also smell something nutty, like walnuts. Overall it's good, but I'm not crazy about the muted quality of the flavors. This is a coffee I would feel confident giving to anyone cause it's so easy to drink. Also I might try brewing this in my Kyoto. Very pleased with this house blend. Balanced and well rounded. Nicely balanced when brewed pour over. Not especially interesting but solid. I liked it but it was a little too citrusy. I would prefer something a little richer. thank you! This was really good stuff. Balanced cup with a nice deep body for a medium roast. Very solid blend! Nice notes of chocolate, with a noticeable hit of citrus as well. I think this one may have been a little more on the citrus side for my preference, but I could appreciate the complexity. Did not like the aftertaste on this coffee at all. I liked the chocolate flavor but not the citrus notes in this blend. A good cup of joe. Wasn't as balanced as the description claimed, it was a little stronger on the citrus. The roast was a little light, but didn't detract from the overall taste. I really liked this brew. The first thing I noticed was the smell! I could have just sat and smelled it. The taste was good, I enjoyed the blend and got the citrus notes in it as well as some of the chocolate. The citrus flavor was a favorite. Well rounded and not too dark. It was a touch bitter for my taste but, not horribly so. Unfortunately, I wasn't a big fan of this coffee. I was initially excited to get a new blend rather than a French Roast, but this one had a strange, bitter, lime flavor to it that I just couldn't get over. The sour taste was kind of overwhelming and didn't allow me to enjoy the other notes of the coffee. By far, the best coffee I have received from Mistobox. Getting a chocolate and nuttiness flavored. Not blown away but solid coffee. The beans leave a very nice smell that hangs within the kitchen while you brew. I've never been one to drink coffee black but the taste is refined enough to not need anything added.It's a clean light blend where the light bite of citrus really adds a fine touch to the coffee.If you're looking for a heavy full bodied coffee, I would look elsewhere, but if you want something to enjoy slowly and unwind with, this is perfect. Love the boldness, very smooth. Uncharacteristically light acidity for a coffee that's a citrus flavored. The chocolate notes defiantly come through. Very good.....can be a little too strong for my taste (I drink it black) when I use the normal amount of coffee, but it's great when I use just a touch less! Can definitely taste the chocolate notes. Very rich and smooth. I just loved drinking this coffee. As a cold brew, it was literally the most delicious thing I ever drank. As a hot coffee, mixed with a little cream, it's so smooth and charming. Love it. Delicious! This coffee has perfect crema, amazing flavor, and perfect strength. Definitely want more of this one! Lacked in flavor notes and all around kind of a flat taste. Smooth taste with a chocolate/smokey flavor to it, but can get quite acidic and almost dry if you don't drink it fast enough. Great cup of coffee to have in the afternoon. Best mixed with heavy whipping cream which brings out a nice nutty taste to it and dulls the acidity that builds up over time. Loved it. Smooth, sweet and damn it smelled amazing. Put in a teaspoon of sugar and milk and it was very soothing to drink. I like this coffee, but don't love it. The citrus notes are pronounced and not my favorite, but it's still very drinkable. One of the best coffees I've gotten so far. Citrus notes are great. Enjoyed! A very smooth and creamy blend with a broad flavor profile. I found a new flavor each time I had it. Citrus-y without being overly acidic. Strong chocolate notes as well. Better by itself than with milk. I actually found the citrus notes to clash with the milk. Good blend overall! I like it! I wish it had more of a hazelnut flavor in it though. This is a subtle and calming coffee. If you're in a hurry in the morning, you'll miss most of the interesting flavors in this one. If you have a moment to savor something that requires concentration and effort, then this one has some distinct rewards. This coffee had the best aroma while it was being ground. Made the entire house smell wonderful. As to taste, we thought it had a strong aftertaste. Coffee was ok.
Easy drinking cup. Enjoyed with a chemex and french press. Dark but not to smokey. Had some chocolate and pleasant toasty flavors. Like this one a lot too - only slightly edged out by the Brazil Blue Diamond - La Colombe. Nicely balanced and full. Good flavor, the tropical/citrus notes were there backed by chocolate, but it was a little weak overall for my palate. This coffe is good and we are enjoying it but I find it a little milder and not as robust as we prefer. Some very good flavor notes (good chocolatey flavor), but could be a bit stronger flavor. Truly a pretty great cup of coffee. My no means does a 3 star mean it is bad. It is exactly as it says it is. Bold notes of chocolate and slightly acidic but not enough to make you turn it down. Solid blend. Nothing too out of the ordinary. Perfect for that daily cup. Not for me. Very forward-acidic. Stays at the front of your mouth and has a lingering tart aftertaste. Very citrusy. Not much depth. Does not feel satisfying. This was really pretty good! It smelled a little better than it tasted but it was definitely a good pick! A very balanced cup, and true to the label on the package, it's very smooth, creamy, and has a nice hit of chocolate. Not really getting any citrus notes, though. Seems like a solid base coffee to go to. Taken with cream and sugar, but works very well black. A bit lighter than I normally like, but my SO loved it, so it will be happily drunk in the morning. smooth; very drinkable--I drink my two cup allotment quickly and want a third but have to stop myself. It was really good but it didn't 'wow' me. Did not get a lot of flavor from this blend. Looking for something a bit more medium and with a nutty flavor. Chocolatey notes-- yeah! Good times had courtesy of this coffee. I give it a smiley emoticon with a tie on rating! Gross. Weak. Felt like I had to use double the beans to achieve a flavorful cup of coffee. I would alike something more medium blend. Is it possible to receive ground coffee? Nice, mellow coffee flavor. One of my favorites. Vary well rounded coffee, Nicely balanced. Very much enjoyed!!! This blend was awesome! It is now one of my favorite blends. It's really good! I really don't know what a 'perfect' coffee for me is yet, so I'll go 4 stars on this one for now. Overall, we really enjoy this one. I really like this blend. It is strong yet smooth and the bold chocolate notes come through perfectly. When I opened the bag, this coffee passed the sniff test with flying colors. It smells SO good. This is my first time grinding my own coffee, so it might be my fault in grinding it too finely, and I probably used too much, but it almost tasted a little burnt. Next cup I brewed I used a little less and it improved the flavor. Next grind I'm going to do it a little coarser, but not bad for the first bag! I'll happily finish this one off in no time. It was more sour than I would have liked I think. Fits the description well. Creamy, minimum acidity, very rich and comforting. Smooth, flavor is somewhat bold yet light. Definitely creamy with a citrusy end. Nice surprise, nice coffee. Just not a fan of Verve. :(. Or maybe it is the house blend. Very smooth and light. Slightly fruity but with just enough body.